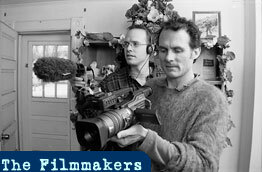 Taggart Siegel has been producing and directing award-winning documentaries and dramatic films for 18 years. Siegel's social documentaries "Between Two Worlds: The Hmong Shaman in America", "Blue Collar and Buddha" and "Heart Broken in Half" have aired on public and cable television and are distributed worldwide. Siegel has also co-produced and co-directed the feature film Shadow of the Pepper Tree and directed short dramatic films including Affliction, Bitter Harvest, Ember Days and Body Memories. In addition, Siegel has produced documentary and dramatic films including "Destroying Angel," "The Beloved" and "The Disenchanted Forest" for National Geographic Television. He is one of the founders of Alchemy Films. Jim McSilver has produced documentaries, shorts and feature films since 1990. He line produced and production managed indie features including Seldom Dreaming and the 1999 Sundance feature Life Tastes Good. McSilver has written and directed documentaries and educational videos for University of Colorado and Lifetime Television about emerging trends in the nursing and health care fields. As an editor, McSilver has cut documentaries including the hour-long performance documentary Dancing Thunder and worked as co-editor on the independent feature film Life Tastes Good. He is a producer and co-director of the feature film in development, TED: A One-Woman Movie.